Enjoy spending your time with friends and family outdoors? 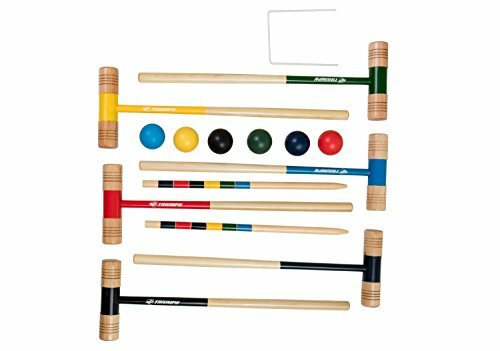 This Triumph 6-Player All Pro Croquet Set allows you to get outside with friends and family. The durable hard wood mallets and turned wooden handles assure that this set is made to last. The 28” x 1.2” handles create a comfortable grip to better strike the 3” balls persistently with the 9” x 2.25” mallet heads. Easily aim for one of the two 24” x 7/8” diameter solid wood end stakes to triumphantly win the game. Need to take it to your family reunion? The padded shoulder bag makes it easy and comfortable to transport your set to your next playing field.